One small stone step leads to the entrance of the property. The ground floor incorporates a raised level which is reached by three steep steps. Steep, wooden stairs lead to the upper floors, where uneven flooring and dim lighting feature. Visitors should be particularly aware of the very low wooden beams in the attic. staff will assist where possible, to offer advice on access to the property. John Harvard was baptised on 29 November 1607, in St Saviour's Southwark, the second son of Robert Harvard, butcher, and his second wife Katherine, the daughter of Thomas Rogers of Stratford-upon-Avon, a substantial butcher, maltster and grazier. 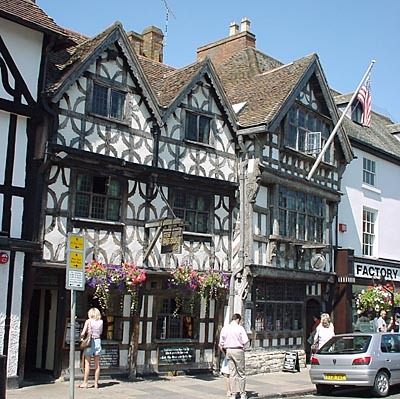 It was Thomas who, after the Stratford fire of 1594 rebuilt the house which now bears the name of his grandson. The theatrical life of London was centred on Southwark in the late sixteenth century and it is quite likely that Robert Harvard knew both William Shakespeare and his younger brother Edmund. It may indeed have been through their introduction that he met his second wife, whom he married at Holy Trinity Church on 8 April 1605. John Harvard was brought up in Southwark and was educated at St Saviour's Grammar School, of which his father was a governor. From the age of 7 boys attended from 7.00 am to 11.00 am and from 1.00 pm to 5.00 pm in winter, and an hour earlier and later in the summer. Their studies were based on grammar, the classics and, increasingly in the early years of the 17th century, on the Bible in either the Geneva or the more recent Authorised version. In 1625 when John was 18, plague once more ravaged the capital and within the space of 5 weeks the Harvard family buried 4 children and their father, Robert. That Robert was a successful man is evidenced by his will, made shortly before his death, in which he left £600 between his surviving sons, of whom there were only two, John and Thomas, at his death. His widow, Katherine, also well provided for, remarried within 5 months and was again widowed 5 months after that, her second husband, John Elletson, leaving her the bulk of his property. It was to be the estate inherited from his mother (who married again), which enabled John Harvard to be such a generous benefactor in the New World. By 1627 John Harvard seems to have decided on the ministry as his career, and the direction of his religious feeling is shown by his entering Emmanuel College, Cambridge. As a broad generalisation it can be said that in the troubled religious times of the sixteenth and seventeenth centuries, Oxford retained an allegiance to High Church principles while Cambridge favoured the path of Puritan reform. Among the Colleges, Emmanuel was noted for its puritan zeal, and indeed many of its alumni were to make their mark in the colonies of the New World, or in the ranks of the leading opponents of the King during the Civil Wars. John Harvard remained at Cambridge for 7 years, graduating B.A. in 1631 and proceeding M.A. in 1636. One of his fellow students at Emmanuel was John Sadler, son of the vicar of Ringmer, Sussex, at whose home Harvard no doubt spent some time, making the acquaintance of Ann, the daughter of the house. John Harvard's mother, Katherine died in 1636 and left him the Queen's Head Tavern in Southwark, £250 and a half share (with his brother Thomas) in houses in Barking left to her by her second husband. Her will refers to him as 'John Harvard, clerk', implying that he had been ordained. John may have returned to the home of his friend John Sadler, for, on 19 April 1636, he married Ann Sadler at the nearby church of South Malling. It seems likely that, after the death of his mother and his own marriage, John Harvard began seriously to consider emigration to New England: relations between the high and low branches of the Church of England had been deteriorating under the concerted attacks of the King and Archbishop Laud on the Puritans, and many clergy were making the move to what was regarded by them as a new land of religious toleration. 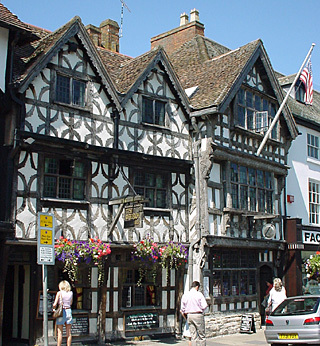 Early in 1637 Harvard sold four housees to a sea captain for £120, retaining the Queen's Head, which was a valuable asset, and the half share in houses held with his brother (who died whilst John was on his voyage). It was probably in the period between selling and sailing that John Harvard acquired many of the books he was to take with him to his new home, realising the importance of education in a growing colony. He would of course have had a small library built up during his years at University, but he seems deliberately to have set about buying more volumes, and it has been estimated that he spent £200 on books. The Harvards sailed some time in March or April, arriving in June or July, for on 6 August he was received as a townsman of Charlestown 'with promise of accommodations as best we can'. On 2 November he was admitted a freeman of the colony and was appointed to the vacant post of teacher at the church of Charlestown. At this date the ministerial duties were divided: the pastor was to 'exhort and apply the precepts of Scripture to practice' and the teacher 'to explain and defend the doctrine of Scripture'. The merits of the new colonist were obviously recognised by his fellows for, in April 1638, he was appointed one of a committee 'to consider something tending towards a body of laws', possibly because he had brought books relating to legal matters with him. This promising beginning was however to be cut cruelly short for John Harvard died, after a short illness, on 14 September 1638, aged 31. He left no written will but made a verbal disposition of his property: half his estate and all his library he left to the proposed new college at Cambridge (the renamed Newtown), the rest he left to his wife who, 15 months later, married the new teacher at the church, Rev. Thomas Allen. It was he who handled the administration of Harvard's estate, the value of which, excluding the library, was recorded as £779-12-2d. The colony had decided that there was the need for an educational establishment as early as 1636 when the Court ordered that £400 was to be given towards the building. Nothing seems to have been done until 1637 when 'The college is ordered to be at Newtown'. Building operations began but it is clear that it was John Harvard's bequest which made the establishment of the college a reality. This was recognised in 1639 when it was ordered 'that the college agreed upon formerly to be built at Cambridge shall be called Harvard College'. Acknowledgements: Mairi Macdonald of the Shakespeare Birthplace Trust. Footnote: John's Cambridge College, Emmanuel, has a commemorative stained-glass window with his likeness alongside which is the inscription "populous qui creabitur laudabit dominum" and at his feet is the inscription "sal gentium". For more information contact Emmanuel College Library, tel: +44 (0)1223 343233. This town house has survived in its present state since the late sixteenth century (although some of the stained glass windows date back to the 14th century), it is now the property of Harvard University. Open to the public its strange and complex history is revealed by its dedicated staff.